Between Hot Toys, Lego and now this, it seems like Iron Man's new Mark 43 armour is by far the most toyetic aspect of Age Of Ultron we've seen yet. And looking at this brilliant new Figurarts from Bandai, I'm not complaining about that one bit. The six-inch scaled Avenger will be the first of Bandai's line of Figurarts based on the upcoming movie, leading the way for Captain America, Thor and the Hulk later in the year (seriously though Bandai, where the hell is Figurarts Hawkeye and Black Widow? I'd pay anything for a Figurarts Natasha!). 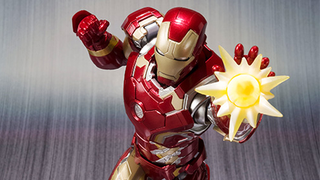 I don't know what it is about them, but I love the 'energy blasts' you can attack as Repulsor fire or jet exhausts. It's a very Japanese-toy sensibility, and it makes the figure look all the more 'comic-booky' when you're posing it. Making 'pew pew' noises is unfortunately not included. Presumably this new Iron Man, like past Figurarts, will come with multiple hands as well as a stand to pose him flying around on too - we'll find out a bit more closer to the figure's April release in Japan, where it will sell for 6,264 Yen, around $52. If you're interested, you can preorder it on AmiAmi!